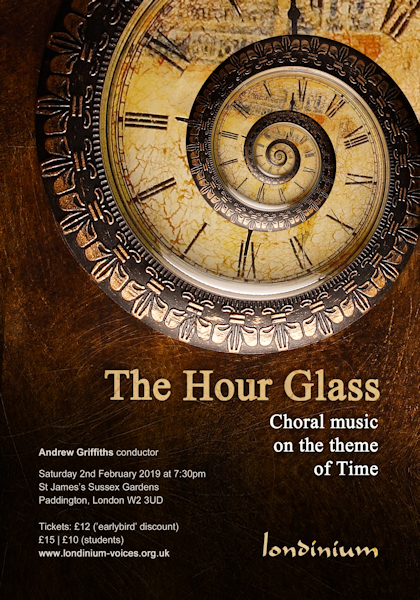 Conductor Andrew Griffiths and his choir Londinium are presenting a concert on the theme of time. The Hour Glass at St James's Church, Sussex Gardens, Paddington, W2 3UD on Saturday 2 February 2019 includes American composer Irving Fine's virtuosic choral suite The Hour Glass and the premiere of Barnaby Martin's I saw eternity alongside an eclectic mix of composers including Byrd, Chilcott, Ligeti, Pärt and Stanford. Irving Fine (1914-1962) was an American composer who was a member of a close-knit group of composers associated with Boston, sometimes called the Boston Six, Arthur Berger, Leonard Bernstein, Aaron Copland, Lukas Foss, and Harold Shapero. Fine was a pupil of Walter Piston and studied conducting with Serge Koussevitzky as well as studying composition with Nadia Boulanger. The Hour Glass was written in 1949 and sets a text by Ben Jonson.